Instagram's the fastest growing social media platform in the world; Businesses on Instagram are seeing higher engagement than on Facebook; Organic reach is actually increasing on Instagram. With reports like this, it's little wonder that brands are clamoring to start their own Instagram ad campaigns, but while the Facebook-owned visual platform opened up their ad offerings to all businesses a couple of months back, many brands are still not entirely sure how they go about creating and implementing Instagram ads, and, importantly, how they can do so in an effective way. To help with this, Instagram's released a new video tutorial and guide outlining exactly how you can go about creating your own Instagram ad campaign - I've broken it down here. Running Ads on Instagram from IG for Business on Vimeo. 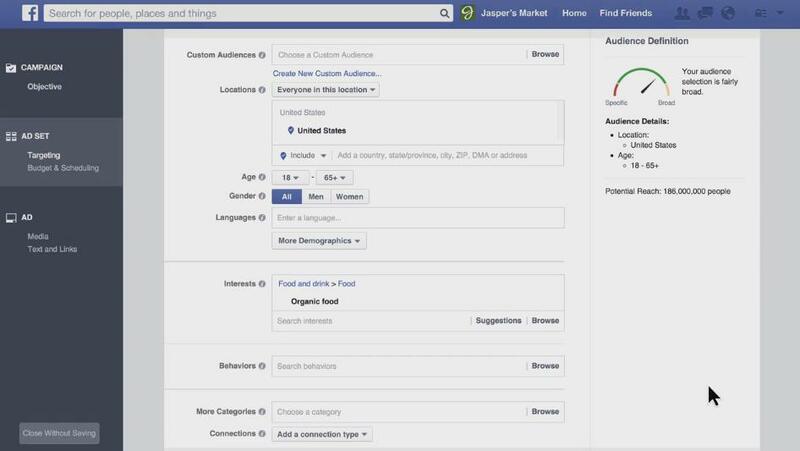 "If you already use Ads Manager to create and manage Facebook ads, getting started with Instagram ads is easy - it's just like creating Facebook ads. In fact, all you need is a Facebook Page." So starts the video tutorial, which goes through, step-by-step, what you need to do to create an Instagram ad campaign. 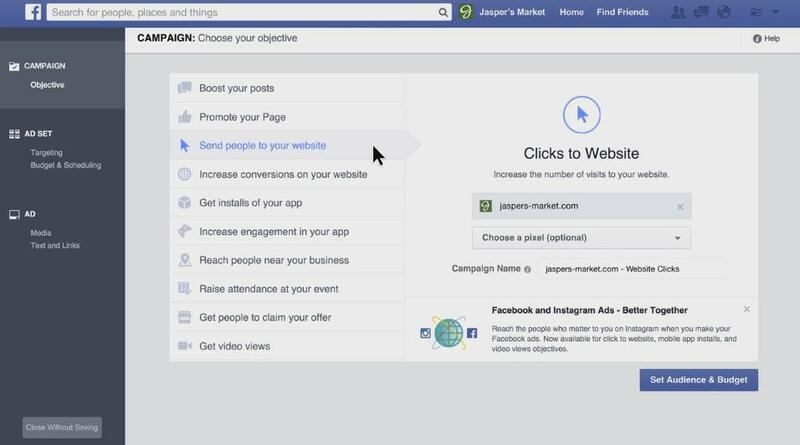 The first step, once you're in Ads Manager, is to choose an objective for which Instagram ads are available. It's worth noting too that not all of these objectives are available for all regions as yet, but they are rolling out over time. Once you've chosen your desired objective, click on 'set audience and budget' at the bottom right. The audience and budget selection is where you determine the targeting and maximum spend you're willing to put into your campaigns - ad spend is entirely defined by you, with reach and exposure determined by the limits of your budget. This is all exactly the same as the current Facebook ads set up, with the next step being 'Choose Ad Creative', where you actually construct your ad. In the creative section, you put together your ad content based on the available tools and options. 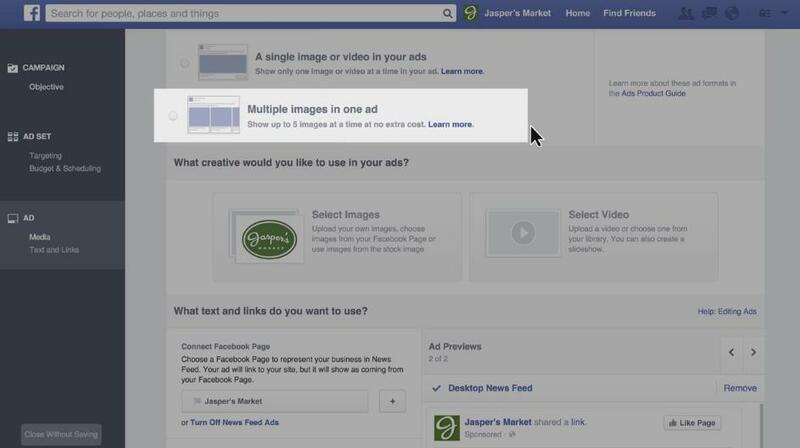 For Instagram, you can choose video, photo or carousel ads ('Multiple images in one ad'). You can use the same photo and video content for your Facebook and Instagram ads or you can use unique content for each. 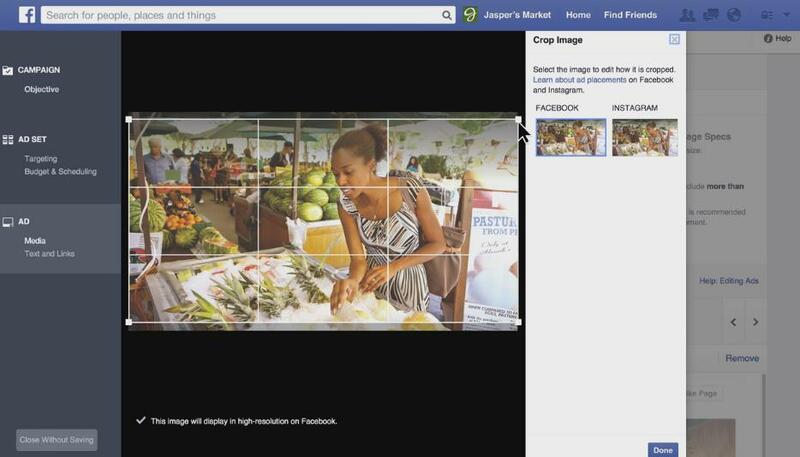 Once you've chosen an image, you can then crop the photo for Instagram or Facebook - the sidebar display shows how the image will appear on each platform. In the text and links selection, you enter the text and can see an example of how your Instagram ads are going to look. 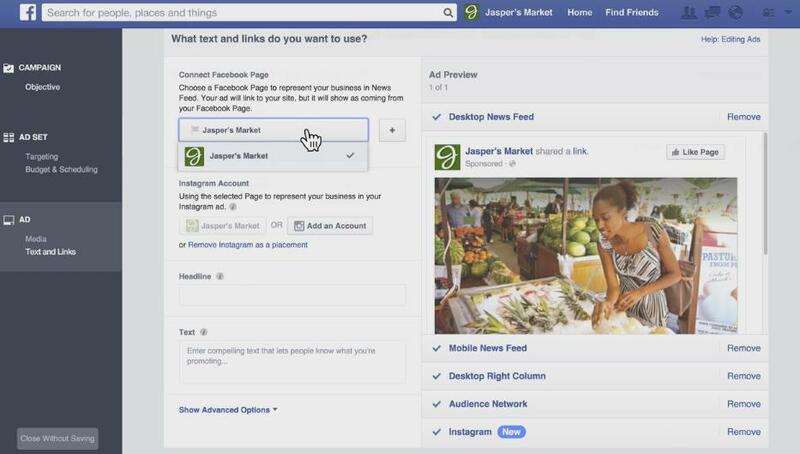 In this section, you need to link up your Facebook Page - even if you're not planning to run your ads on Facebook, you still need to connect your Facebook Page. You can also add your branded Facebook account at this stage of the process - in the image below, you can see the 'Add an Instagram Account' option just below the Facebook Page. Worth noting: Even if you don't have an Instagram account, you can still run Instagram ads using your Facebook Page. Once you've entered your headline and ad text, you can see how your ad will look on Instagram by clicking on the Instagram option in the listing on the right of screen. It's important to make sure the blue tick is visible next to 'Instagram' if you want your ad to run on the platform. Once you're happy with how the ad looks, click 'Place Order' at the bottom right of screen and Instagram will review your ad, then approve (or not) within 24 hours. Create an Instagram account - As noted, you can create Instagram ads without an Instagram account, but the platform recommends that brands do create an Instagram presence in order to access their full suite of ad tools - like comment moderation. Anything you do on Facebook, you can do on Instagram - A lot of Facebook's ad features have now been built into Instagram advertising as well, including the ability to target your ads to very specific audience subsets and categories - on which front Facebook's data capabilities are the most advanced available. Track your results - Using the Facebook pixel - a line of custom code that you add to your website - you can track the performance of your Instagram campaigns, optimize for conversions and re-target people who've visited your website. 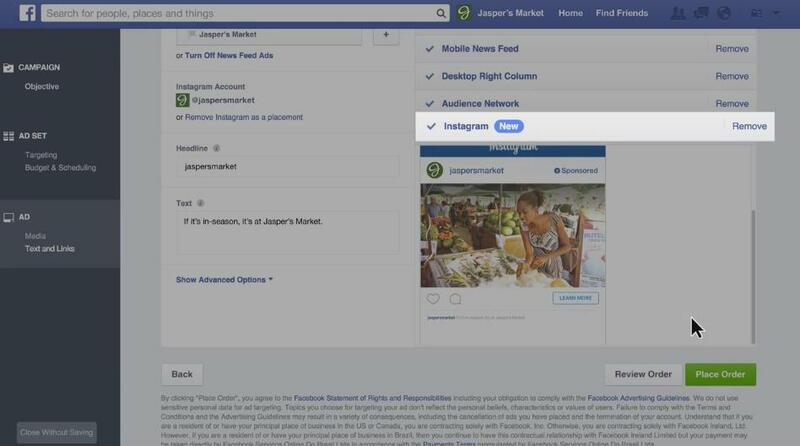 The process is relatively intuitive and easy to follow, and Facebook's working to improve the availability and options of Instagram ads for all regions - if what you're seeing is not exactly as outlined in the video, it soon will be.